We Are Not Victims of Heredity by Bruce H. Lipton, Ph.D.
Crisis ignites evolution. The challenges and crises the world faces today are actually signs that change is imminent. We are living in exciting times, for modern science is in the process of shattering old myths and rewriting the story that has shaped the fate of human civilization. It is a simple fact: Our world changes when our perception of life as we know it changes. The old ways of seeing, believing, and reasoning will not help us transform the current conditions, simply because they are the primary reasons for the crises that threaten us today. Changing our understanding of biology and human history offers information and inspiration that will help us navigate these turbulent times. In order for us to more effectively deal with threatening global challenges and contribute to the evolution of our planet, we must first shed our image of being helpless victims and learn the truth as to who we really are. A good starting place is to first acquire a more accurate account of how life works. The new science is toppling the unquestioned pillars of biology, including our perceptions of random evolution, survival of the fittest, and the role of DNA. More than 40 years ago, my research was involved with isolating individual stem cells. Stem cells are the equivalent of undifferentiated embryonic cells that are scattered throughout your body. Their primary function is to replenish the billions of cells that are lost every day due to normal attrition, as well as repairing damaged or dysfunctional tissues and organs. My research on how the environment controlled the fate of these cells presaged one of today’s most important fields of science, epigenetics. Epigenetics is the field of study that assesses the mechanisms by which environmental information interfaces the genome and controls genetic activity. Previous to epigenetics, science and the public were preoccupied with a belief emphasizing “genetic control,” the belief that genes controlled their own expression. Through the process of “perception,” the brain interprets the environmental signals, and in response releases regulatory chemicals into the blood. The chemistry derived from the brain circulates throughout the body and controls the behavior and genetic activity of our cells. Consequently, the way we “perceive” our environment, controls our health and fate. Most importantly, when we change the way we respond to the environment we change our health and fate. Under the archaic belief of genetic control we essentially perceived ourselves as victims of our heredity — if cancer or Alzheimer’s was in our family lineage, we were led to believe that we should anticipate that we might get stuck with the same fate.However, epigenetic science completely rewrites that limiting belief, for it reveals that through our “mind,” we can change the chemistry of our blood, and in the process, become masters of our fate. When the mind perceives that the environment is safe and supportive, the cells are preoccupied with the growth and maintenance of the body. In stressful situations, cells forego their normal growth functions and adopt a defensive “protection” posture. The body’s energy resources normally used to sustain growth are diverted to systems that provide protection during periods of stress. Simply, growth processes are restricted or suspended in a stressed system. Although our systems can accommodate periods of acute (brief) stress, prolonged or chronic stress is debilitating, for its energy demands interfere with the required maintenance of the body, and as a consequence, leads to dysfunction and disease. The principle sources of stress are the misperceptions that have been programmed into the system’s “central voice,” the mind. The mind is like the driver of a vehicle; with good driving skills, a vehicle can be well maintained and provide good performance throughout its life. If we employ good “driving skills” in managing our behaviors and dealing with our emotions, then we should anticipate a long, happy, and productive life. In contrast, inappropriate behaviors and dysfunctional emotional management, like a bad driver, stresses the cellular “vehicle,” interfering with its performance and provoking a breakdown. Its supporting partner is the subconscious mind, the equivalent of a record-playback device that downloads our life experiences. The subconscious mind is a supercomputer loaded with a database of programmed behaviors. Some programs are derived from genetics; these are our instincts, and they represent nature. However, the vast majority of the subconscious programs are acquired through our developmental learning experiences, and they represent nurture. The subconscious mind is not a seat of reasoning or creative consciousness; it is strictly a stimulus-response mechanism. When an environmental signal is perceived, the subconscious mind reflexively activates a previously stored behavioral response — no thinking required. The subconscious mind is a programmable autopilot that can navigate our vehicular bodies without the observation or awareness of the pilot — the conscious mind. Similarly, if our subconscious mind is programmed with inappropriate behavioral responses to life’s experiences, then our sub-optimum “driving skills” will contribute to a life of crash-and-burn experiences. For example, cardiovascular disease, the leading cause of death, is directly attributable to behavioral programs that mismanage the body’s response to stress. In our conscious creative mind we may consider ourselves as good drivers; however, self-sabotaging or limiting behavioral programs in our subconscious unobservably undermine our efforts. We are generally consciously unaware of our fundamental subconscious perceptions or beliefs about life. The reason is that the prenatal and neonatal brain is predominately operating in delta and theta EEG frequencies through the first six years of our lives. This low level of brain activity is referred to as the hypnogogic state. While in this hypnotic trance, a child does not have to be actively coached by its parents, for children obtain their behavioral programs simply by observing their parents, siblings, peers, and teachers. Did your early developmental experiences provide you with good models of behavior to use in the unfoldment of your own life? During the first six years of life, a child unconsciously acquires the behavioral repertoire needed to become a functional member of society. In addition, a child’s subconscious mind also downloads beliefs relating to self. When a parent tells a young child it is stupid, undeserving, sickly, or any other negative trait, this too is downloaded as a “fact” into the youngster’s subconscious mind. These acquired beliefs constitute the “central voice” that subsequently controls the fate of the body’s cellular community. Although the conscious mind may hold one’s self in high regard, the more powerful unconscious mind may simultaneously engage in self-destructive behavior. If I Am Creating My Own Life ... I Wouldn’t Have Created This!The insidious part of the autopilot mechanism is that subconscious behaviors are programmed to engage without the control of, or the observation by, the conscious self. Most importantly, neuroscience now reveals that the subconscious mind, which is an information processor one million times more powerful than the conscious mind, runs our behavior from 95 to 99 percent of the time. The powerful meaning of this reality is that we only move toward our wishes and desires from 1 to 5 percent of the day. In the remaining time, our lives are controlled by the habit-programs downloaded into the subconscious mind. The most fundamental of these programs were downloaded by observing other people, such as our parents, siblings, teachers, and community. The profound conclusion is that 95 percent or more of our lives is programmed by others! As we become more conscious, we rely less on automated subconscious programs, and also have the ability to rewrite limiting, disempowering beliefs formerly downloaded into the subconscious mind. Through this process we become the masters of our fates rather than the victims of our programs. Conscious awareness can actively transform the character of our lives into ones filled with love, health, and prosperity by its ability to rewrite limiting perceptions (beliefs) and self-sabotaging behaviors. Through diligent use of our consciousness, we can create lives expressing everything from sublime health to disease. We are no longer victims of forces outside ourselves, nor can we continue to blame such external forces for characteristics and attitudes that we ourselves can change. To secure the future we desire, we must empower ourselves with the knowledge of who we truly are—conscious co-creators of our destiny, who are each cells in a new organism called Humanity. We must change our mission from one based on survival of the individual to one that encompasses survival of the species. With an understanding of how our programming shapes our lives and with the knowledge of how we can change that programming, we can rewrite our destiny. 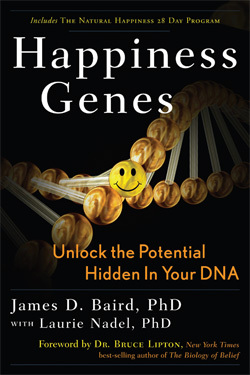 Reprinted from HAPPINESS GENES © 2010, James D. Baird and Laurie Nadel, with permission by the publisher, New Page Books a division of Career Press, Franklin Lakes, NJ, 800-227-3371. All rights reserved. Bruce H. Lipton, PhD, is a cell biologist and best-selling author of The Biology of Belief: Unleashing the Power of Consciousness, Matter and Miracles.